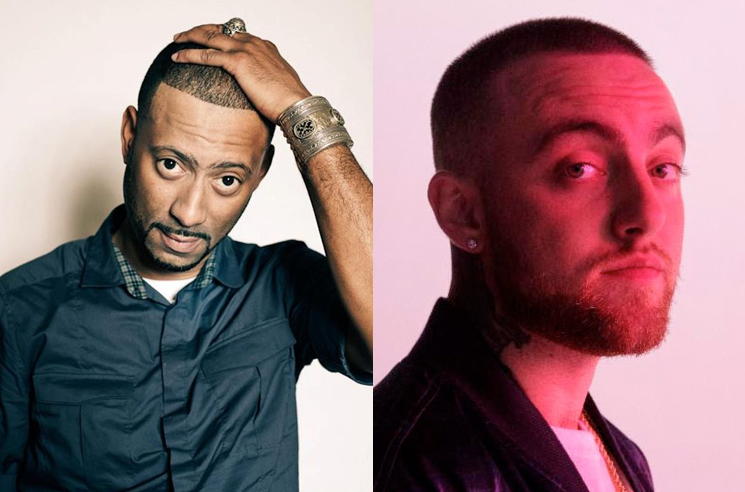 "The idea was to create for creation's sake"
Back in February, it was revealed that Madlib had recorded a collaborative project with the late Mac Miller, fittingly dubbed Maclib. The news naturally left fans of the pair scrambling to hear more, and it has now been revealed whether or not the effort will see release. In a post on Rappcats, Madlib associate and producer Eothen "Egon" Alapatt revealed that there are no plans to release the material, writing, "the idea was to create for creation's sake." "What exists is what the two had originally intended – an EP's worth of music that was supposed to be the start of something," Egon's post explains. "The end point wasn't planned out or even discussed." Egon revealed that Miller first met Madlib after the MC recorded a verse for Freddie Gibbs and Madlib's 2014 LP Piñata. Miller was then recording songs over batches of Madlib-produced beats by early 2015. Madlib played one of Mac's tracks in July of 2016 at a European festival and Egon texted Mac to tell him. "Whaaat what song why isn't there any video evidence!!!" was the reply. Followed by "Let's do an EP." This process continued throughout 2017 as Mac got the latest beat batches, continued recording, and continued his commitment to the project. "I feel like we can create something special," he texted Egon in August 2017. Meanwhile, Madlib continued playing a song here and there in a festival set, and word would get back to Mac. "My homie sent me a video of one of the joints me and Madlib did that he was spinning," he texted. "Made me happy." As for the Maclib title, the post explained, "Like Jaylib, it was just in the metadata of one of the files he sent over. 'MacLib – Number 4' it read. The song still doesn't have an official title, and there are no official plans to release the EP." Lately, Madlib has been working in some of the aforementioned unreleased material into his DJ sets. At a show in San Diego this past weekend, he played unreleased material featuring Miller and Thundercat, in addition to a song featuring Gibbs. You can find that clip below. Last September, Miller passed away at age 26.